Immersion circulators are one of the most affordable pieces of cookery that you can invest in, and even if you opt to buy one of the best immersion circulators on the market, you still won't have to spend over $200. There are other types of water bath ovens that produce similar results, but they can cost $500 or more depending on the brand. Prices for the premium models of immersion circulators still cost way less than the budget models for water ovens. We've also reviewed cheaper immersion circulators, which cost even less, and do just as good a job as these premium models. So why opt to pay more? The best models I featured in this list come with options like Wifi connectibility, in-app control for remote cooking, and excellent recipes to follow so you don't have to read someone's life story looking for sous vide recipes. You can also see our review of the best sous vide water ovens for some seriously high tech sous vide cooking! 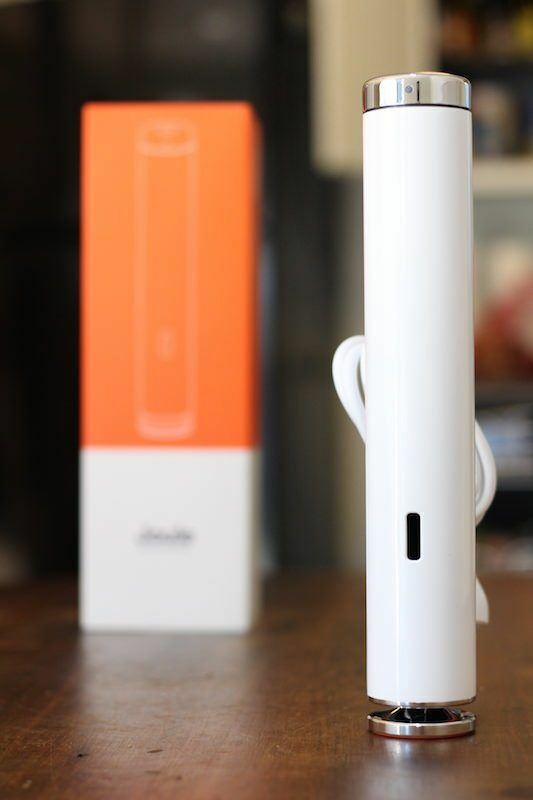 If you don't have the time read through each of these reviews in detail, I'll just spill the beans here and let you know that our #1 pick is the extremely popular Chefsteps Joule. It's a company that specializes in sous vide cooking, so it's no wonder the completely dominate this appliance category on all fronts. They are miles ahead in terms of design and user friendliness. Numbers 3-5 are reviewed in the “cheaper” section linked above. I've picked the Joule and Anova Cooker as my top choices because they are quiet, strong, made of durable material, and have a great design. The others on the list are featured for a variety of reason which you can read about in detail on each of their individual reviews. Magnetic + Side Clip, So Works With Any Pot Size! The Joule is a quiet and powerful immersion circulator designed to have no display, for truly connected sous vide cooking. This is because it is controlled solely by an app on any smartphone. It works via WiFi and Bluetooth connectivity, and it gets smarter every time it is used. It will remember previous settings so it can be honed to perfection over time. It has an automatic shut-off feature that helps in case of spills and also has protection against high currents to keep it safer and even better to set and go. It fastens to whatever vessel you put it in with a foot clip that is magnetic for extra security on a metal pot or container. 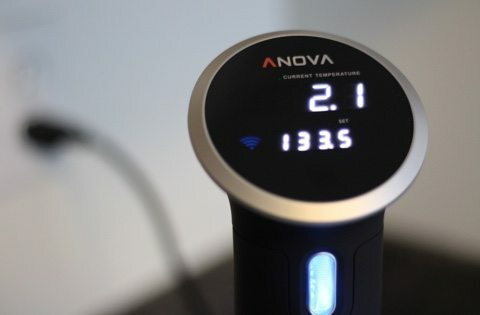 This is one of the only connected devices that help you cook sous vide even better with more accuracy and consistency. The only downside to this immersion circulator is that is it still in the pre-order stage, since it is such a new device. OK, one unexpected downside is that there is no digital display to see temperature and time. That's all controlled through the app. That does however, mean you can check on your food while running errands or working on the computer. 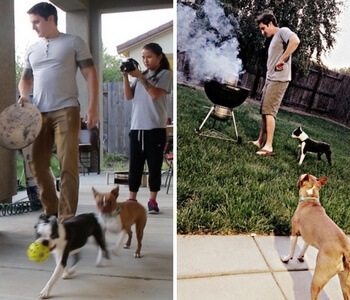 No need to step into the kitchen. In fact, I'm cooking a steak while I write this right now! You get to pick your “doneness” by watching the video. Then select the thickness of the meat (if applicable), and it gives you a cooking time. Easy as that! If you own the Joule, you can then set your device to cook at that temp for that amount of time all through the app. If you're using another circulator, you'll need to set those settings manually. 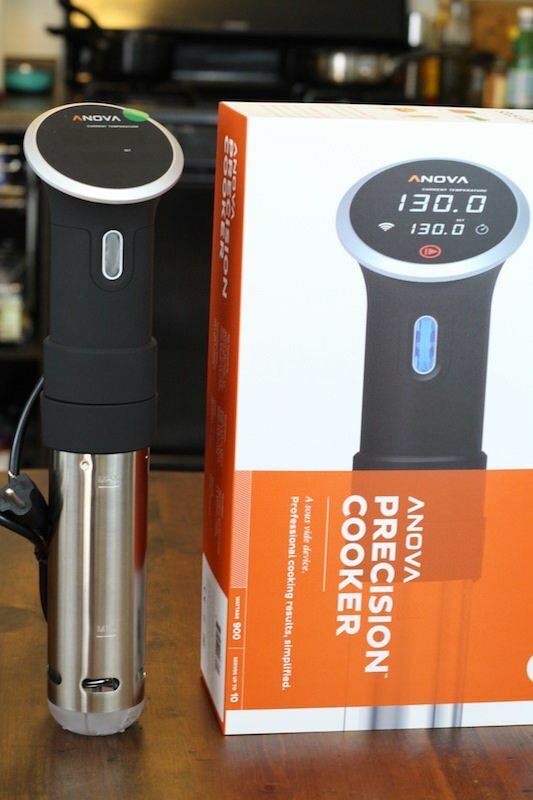 This Anova Bluetooth Precision Cooker is the improved and updated immersion circulator from the 1st generation model. Gallons Per Minute of Circulation has doubled, heating power has increased by 100 watts, and now you have full connectivity to wifi for remote access from anywhere with an internet connection. This is also notably one of the quietest models of non-commercial sous vide immersion circulators. This immersion circulator comes with an adjustable clamp that simply clips on to the immersion container you are using. The most intriguing feature is the iOS or Android app that you can use to set time and temperature for your food, which will alert you with push notifications when your food has hit set temperatures, or is finished. It's not the only circulator that comes with an app, but it is one of the better ones. The Precision Cooker is specifically made to pair via Bluetooth to your phone so that you can set time and temperature with accuracy and get on with your day. If you prefer, you can also simply set the time and temperature manually on the LCD display with the LED back-lit scroll wheel. You can also access a large collection of recipes via the app. Since then, their smaller version Sansaire Delta has failed to launch, and they are now trying to sell a glorified blowtorch for searching. This immersion circulator is still good, but it just hasn't kept up with industry improvements. It's large, plastic-y, and the app isn't great. That being said, it's still a solid device. Many people have modified a picnic cooler to house larger amounts of food such as a rack of ribs. Actually though, the neatest feature of this one is that it's quite round and flat, so you do not need to use the clip at all. It will sit flat on the bottom an any pot or cooler, right in the center! Most circulators require being clipped onto something. For those that want a large range of temperature control, the Sansaire is an excellent choice and will have you cooking amazing meals in no time with accuracy as it is within a 0.1 degree range around a selected temperature. It is also a great sous vide cooker for exploring this method of cooking before committing to a more expensive model. These two models are selling at a premium price, but unnecessarily so. 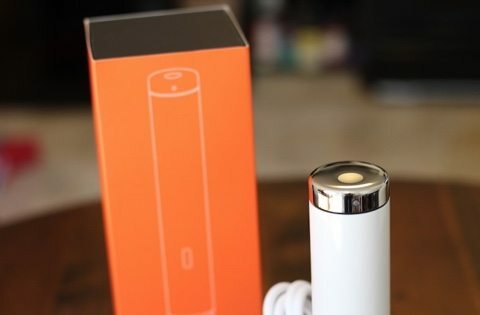 They have a few features like being able to circulate more water (to cook more food), but for most folks, it's not worth the $600 premium in some cases. This is the closest you can get to a commercial grade immersion circulator for home use. It is one of the more expensive items on this list, but it can handle heating 30 liters of water per minute, which vastly exceeds the limitations of some of the immersion circulators available. 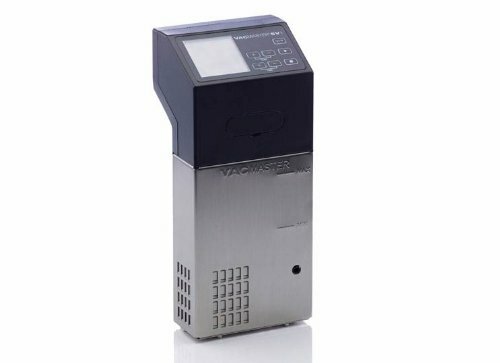 VacMaster is known for their vacuum sealing equipment and supplies, so it makes sense that they would produce such a product since these two go hand in hand. This immersion circulator looks a bit more industrial than sleek, but features easy to clean square surface area and stainless steel for the immersive portion. It has easy to use buttons that allow the user to set temperatures and also time, with alerts to indicate water heating and circulating. Since it has a larger heating and circulating capacity, the only limitation is that it is not as speedy as some of the other devices available. 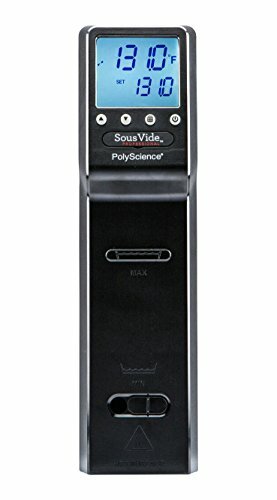 The Polyscience CHEF Series is great for larger menu items, such as steaks or roasts for an entire dinner party. The best part about sous vide is the ability to cook even multiple meals at once all held constantly at the perfect cooking temperature. In fact, this is the main reason to buy this particular unit – for frequency of use and for cooking large meals. At 7.1 pounds it's made of much more sturdy material than the majority of other sous vide units (almost double the weight). It's also made in America, so you can expect the best craftsmanship. The clip is a bit small at only 11/8 of an inch so using a thinner pot is recommended. Many users have purchased polycarbonate tanks that accommodate the perfect amount of water for this particular immersion circulator. So basically, if you plan to be cooking sous vide often, and for lots of people, this is a great device to consider. If you're more of a casual cook, you don't need to spend this much money on a device. You can get a very fancy, very cool-looking option (our #1 choice, in fact) for 4x less. 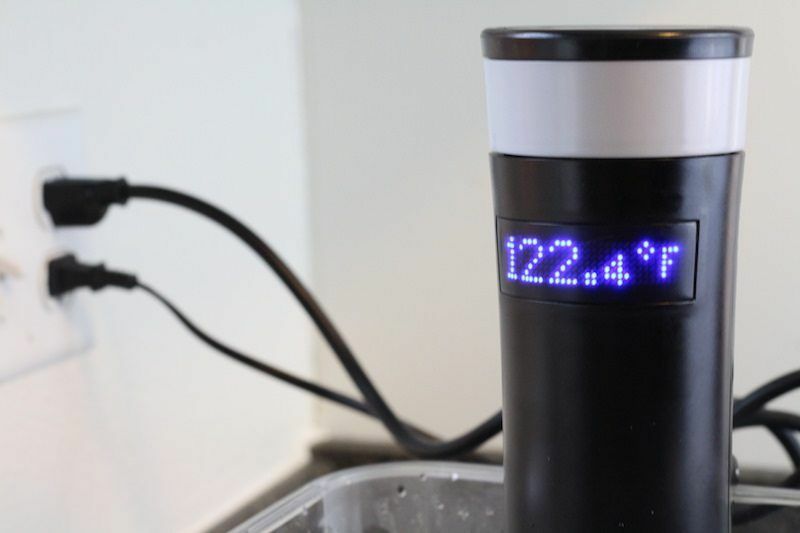 Our top pick is 110% the Joule immersion circulator from ChefSteps. It's clearly the best designs in terms of style, and it's made by people that specialize in sous vide. The slim device and white color add an air of sophistication to your culinary adventures. I waited for a long time for this device to come out, and was amazed at the app that accompanies it. You'll find recipes, temperature guides, and other extremely helpful tips in full-color, tech-savvy fashion. What's more, they actually update the app regularly. With 1100 watts of power, this immersion circulator has plenty of strength to cook anything you throw at it. I was very surprised during the testing phase of all these devices how much slower those 800 watt models are at getting tap water up to the correct temperature. 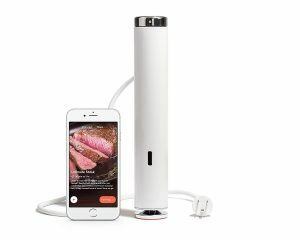 The beautiful design, smart app, helpful guides, and practical power means that the Joule delivers on its promise of being the best sous vide immersion circulator out there. It may even be a better solution than a water oven, which can cost 2-3 times more and has the obvious limitation of space!